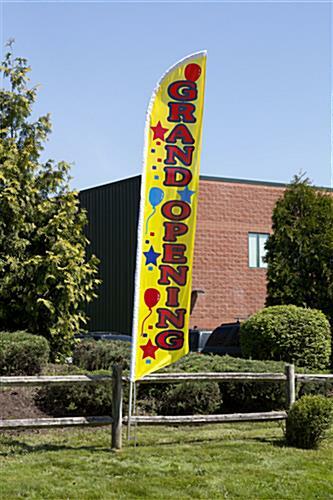 These Grand Opening Flags are Sure to Attract Attention. This Display is One of Many in Stock Banner Options. 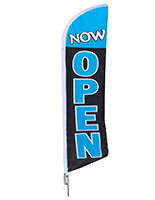 These Grand Opening Flags are In Stock Now! Single side printed message dyed through for a reverse image on the backside. 14' Height multicolored banner for a highly visible display. 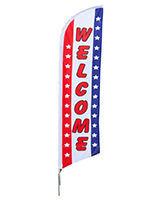 These grand opening flags that include a lasting ground spike may be used in front of almost any establishment. This signage is pre-printed on a poly knit material that endures outdoors. These grand opening flags that include feather-shaped pennants wave in the wind. This business advertising display has a stay open design so the banner is constantly visible with or without wind. 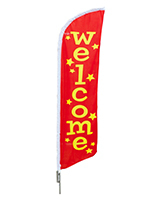 These message banners, grand opening flags that are for outdoor use include a portable aluminum pole that can be taken in during inclement weather. This feather swooper is the ideal low cost advertising tool for businesses to promote and even suggest that a sale is happening. 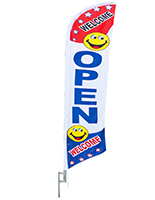 These grand opening flags are colorful eye catchers that can help boost sales! 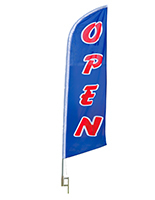 This message banner is economical for small businesses seeking exposure. 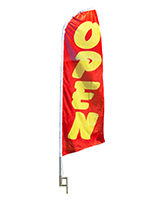 These tall grand opening flags, also known as advertising swoopers, demand attention from potential customers. 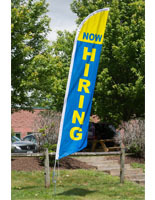 This advertising feather banner is sold at a low price point due to the use of an aluminum pole. 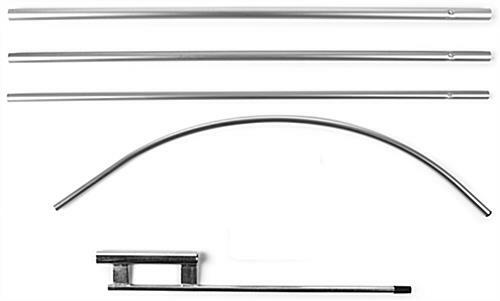 Compared to fiberglass poles, these aluminum poles are a fraction of the price! 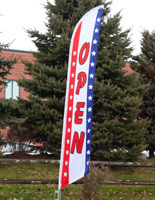 These grand opening flags are pre-shaped unlike many fiberglass poles that move with the wind. This signage also does not include a nylon carrying case like many "deluxe" models. These portable grand opening flags set up in minutes. Users can strategically place this display near the roadside to attract passerby customers whether in a car or on foot.